I attempted to explain to Swerdlow that he needed to leave the location and if he didn't leave I would arrest him for impeding this investigation. Swerdlow continued to argue with me and did not make any attempt to leave. I arrested Swerdlow for PC 148, impeding a law enforcement investigation. I handcuffed him with his hands behind his back and double locked the handcuffs. 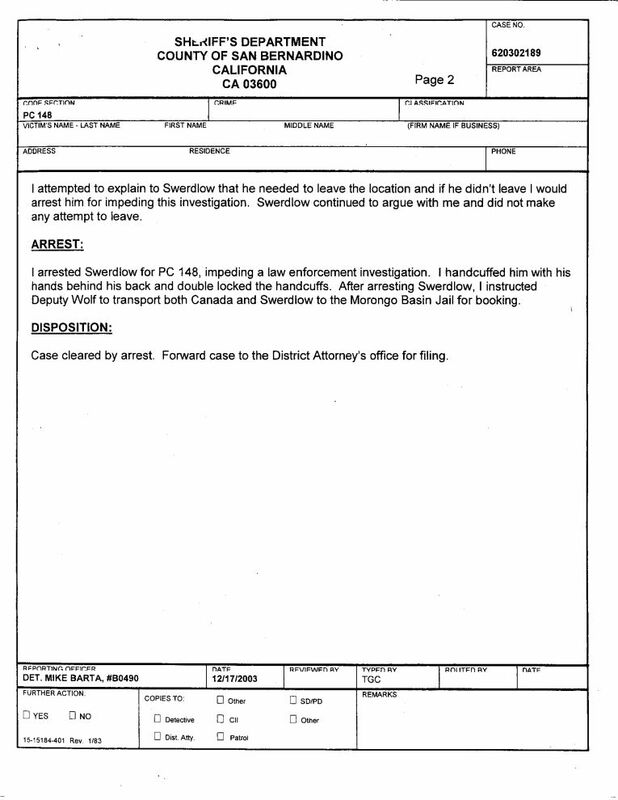 After arresting Swerdlow, I instructed Deputy Wolf to transport both Canada and Swerdlow to the Morongo Basin Jail for booking. Case cleared by arrest. Forward case to the District Attorney's office for filing.